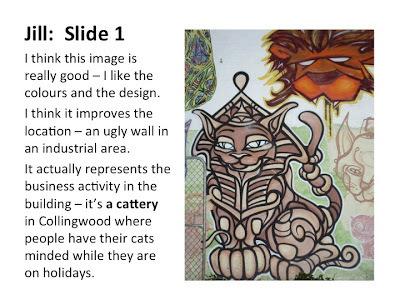 ESL Three at CNLC: Make a Powerpoint presentation: is graffiti art or vandalism? 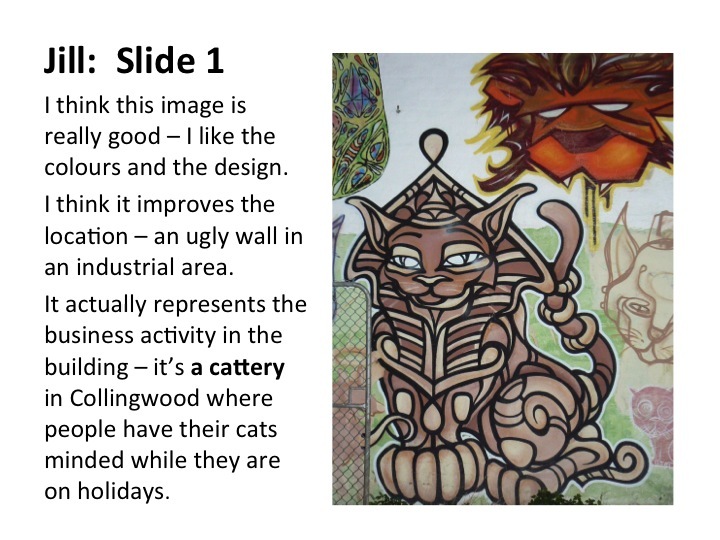 Make a Powerpoint presentation: is graffiti art or vandalism? While we are looking at different examples of Graffiti, it is a good opportunity to search for some photos of graffiti on the internet, save them to your Photos sub-folder and make a presentation to share with the class. If you have taken some photos on the streets in your neighbourhood, you can also use them. You'll have to save them to your Photos sub-folder in your Folder on the Students' Drive first. Pin the Powerpoint program (app) to your Taskbar: this is a good idea because it's a lot quicker than finding it in the Start Menu each time you want to open it. Insert New Slide - and choose the Layout: Content and Captions - see the examples below. You can type your title and text, and insert your photo. You might need to change the size of the Title and Text boxes, and even the photo too. Have I forgotten any skills?? ?